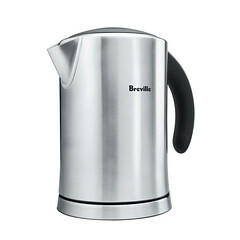 The Breville® Soft Top™ — Cordless convenience in a fast-boiling kettle that complements the modern kitchen. 1500 watt heating element with a high-capacity (up to 54 fl oz) vertical-design heats quickly. 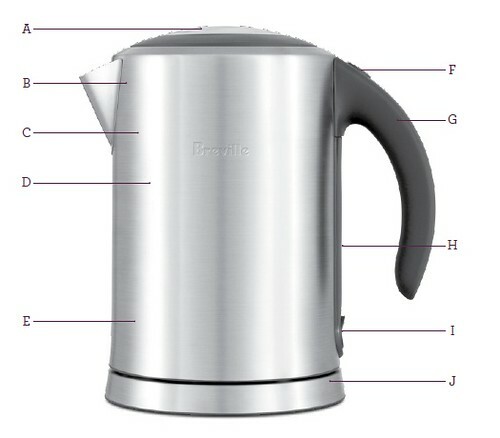 Auto-off tracks the internal temperature and shuts the kettle off when it reaches a boil. Pleasant chimes alert you to the completion of a heating cycle. A. Soft Opening Lid with Viewing Window. B. Scale Filter. C. 7 Cup/1.7 Liter Capacity. D. 1500 Watt Rapid Boil. E. Auto Shut-Off & Boil Dry Protection. F. Lid Release Button. G. Ergonomic Handle. H. Illuminated Water Gauge. I. Power ON/OFF Switch. J. Multi-Directional Base with Cord Storage.